I’m sitting by the wood fire with the rain falling steadily outside onto the green garden. It’s fragrant with the scent of all the cyclamens I bought this year to put in pots. I hadn’t realised what a beautiful perfume they had. I picked some roses before the rain drenched them, Monteverdi’s exquisite lilting Vespers – trumpets and choirs – is playing, and I had for lunch a delicious helping of the grocer’s bargain Gorgonzola Dolce with fresh sour dough bread. And coffee. My coffee tastes entirely different now that I’ve learnt to put the milk in first, thanks to the coffee drinking bloggers who commented on the blog I’d written about tea, and how Milk in First – so frowned upon by the pukka – is actually more delicious than milk poured in after the tea. So I’m now drinking coffee milk in first. I’ve been watching a blackbird pecking at a red apple nailed to the fence outside the window. The sparrows love their grain in the swinging blue and white bowl suspended from a tree near the bird-bath. As I watched them, I was amazed to see a host of different birds in the garden, so unusual in this country. There was a wood pigeon sitting in the guava tree in its approved partridge in a pear tree fashion, three pink-breasted grey doves pecking on the grass, a couple of tuis frisking in the bottle brush tree, sparrows in the feeding bowl, fan tails flitting around between plum tree and bird bath, a couple of lime-green and grey wax- eyes flickering among the leaves, and to my astonishment, a gold finch pecking around the green copper with pink cyclamen – the pink and the gold, and the verdigris of the copper a delight. The tiny wax-eyes or silver -eyes, which are half the size of a sparrow – would top the list of NZ birds I love. Victorian Walter Buller, the earliest NZ authority on birds, called them silver-eyes. They ‘re supposed to have arrived in New Zealand in June 1856. Buller wrote: ‘…in the early part of June of that year, I first heard of its occurrence at Waikanae, a native settlement on the west coast, about forty miles from Wellington. The native mailman brought in word that a new bird had been seen, and that it was a visitor from another land. ‘A week later he brought intelligence that large flocks had appeared, and that the “tau-hou” (stranger) swarmed in the brushwood near the coast; reporting further that they seemed weary after their journey, and that the natives caught many of them alive’. Buller tells us that they were then seen in numbers in Wellington, and greatly welcomed as they ate the aphis known as American Blight which was ruining the settlers’ apple trees. The little silver-eye has flourished here ever since its epic thousand-mile journey across the Tasman. Why did they come, flocks of them, not just a few blown by the wind? What a great heart in a tiny frame, and what impelled each one to embark on this huge migration across an ocean? Flocks of them sometimes clung exhausted to the masts of ships in mid-ocean. How did they know that a land, New Zealand, was awaiting them at the other side of the trackless sea? And how sad, that at the end of the endless journey, tiny wings beating against the winds, they were so exhausted, that many were caught by hand by Maoris and ended their lives precipitately in the Promised Land. Whenever I see the tiny green creatures flitting in and out of the birdbath, sipping the honey in the bottle-brush tree, and nibbling the apples I put out in winter, I remember their great journey and noble hearts. Was their quest a search for a better life, like so many of the settlers, who in those same years also sailed across oceans for six months to reach here, surviving perils which included drowning, sickness and starvation? This quest of men and birds took not just courage but a leap of imagination, and I wonder if these are the times now when we must all also take another leap of imagination and courage to save the dear earth that we know – to take, in Christopher Fry’s words, “the longest stride of soul men ever took”. Eckhart Tolle has warned that all the structures that we’ve always known will start to crumble, and we are now seeing trusted institutions, organisations, freedom, democracy, justice, free speech, free press, the environment – all under threat. So this must be the time to take that long stride of soul – to create new ways of living on this planet, salvaging the best, and joining together to share peace and goodwill, as well as food and resources. The Dalai Lama has said that meditating is not enough – we need to act – and Thich Nhat Hanh has warned us that we can’t go on the way we are doing. He says otherwise: “ … there is no doubt that our civilisation will be destroyed. This will require enlightenment, awakening. The Buddha attained individual awakening. Now we need a collective enlightenment to stop this course of destruction.” So enlightenment, it seems, is a journey which we can’t delay, and however difficult this may seem, and whatever it means to different people – as Lao Tzu so famously said nearly fifteen hundred years ago – a journey of a thousand leagues begins with the first step. As a threadbare gourmet, I pride myself on getting at least eight meals out of a chicken, so I put the legs into the deep freeze to take out when I wanted them. After de-frosting and taking the skin off, I added them to a pan in which I’d sauted garlic and chopped mushrooms in butter and cream. I also crumbled a chicken cube in a little boiling water and added it to the mix to boil up and thicken. Then I stirred in half a teasp of Dijon mustard, some nutmeg, salt and freshly ground black pepper. Sometimes I serve this on pasta, this time I served it with buttery, creamy mashed potatoes, peas, and carrots. Life is an endless struggle full of frustration and challenges, but eventually you find a hair stylist you like! quite easy really. I cut the chicken down the spine like the French do, and that means four helping of breast, the risotto made enough for three, and the chicken legs another two – so nine meals actually !!! I have really enjoyed reading about the migration of the wax-eyes to New Zealand…..I had no idea about that. They are so tiny but obviously stoic and immensely strong in their own special way. I love to watch them feed on the aphids – I cheer them on as they nip in and out on the rose bushes feasting up large…..three cheers I say!!!! I have noticed that when the Fantail calls into the garden these days that he/she always has a wax-eye with it. It looks like “The Boss” and his “sidekick” as the size difference is so noticeable and the wax-eye follows along behind. Both are insect lovers and the wax-eye obviously knows that the fan tail and it’s insect stirring tail will provide easy pickings of insect delicacies…..canny wee bird!!! The southerly is howling today, it is very cold and wet from passing showers so bird life is less obvious in the garden so far today. yes, we are cold today, wind and rain, and hot soup for lunch !!! Thank you. I do laugh when I see the Boss and his Sidekick. I put apples out for the birds last year but that seemed to attract an oppossum into the garden and I don’t want Jazz tangling with that if I can help it. That’s a good chicken dinner all right, but eight meals? Meaning one meal for eight people? Or eight meals for one? I need to know how unthreadbare I am. Well no, not one meal for eight people… I’ve been offering recipes from a steamed chicken over the last two or three posts. Steamed chicken for two as per recipe the first day – cold breast of chicken for two the next day; risotto using the chicken stock from the steaming, plus scraps from the carcass, and finally the de-frosted chicken legs – that makes four meals, eight servings… it was a good sized chicken… I suppose frugal would be the word for it !!!! Well, I admire that and I’ve learned a little, too! Loved the post. It was so refreshing–the scent of the flowers and the vivd birds that you’ve described. Thank you so much – so glad you enjoyed the post…. What a lovely garden spot–thick with green. Your writing too is thick with life! PS. yes, when I moved here it was just yuccas and stones and some succulents… I decided I had to make it thick with green, just as you say !! How close to nature you are Valerie. I enjoy reading your observations. I too love the wax-eyes, but no idea they had come here after such a heroic journey. I love that phrase, ‘long stride of soul’, and the concept of collective enlightenment. You write beautifully. Thank you. Juliet, thank you for all your thoughtful comments, as you would know, it’s so satisfying when readers actually ‘notice’ what you’ve written….so glad you enjoyed the post. I’ve read your instructions for how to get to your blog, and when I’ve got a trying computer problem sorted ( internet problems ) I will turn up there! I will have the kettle boiling, ready for your visit. And an excellent stock with the bones with which to make a variety of soups – clearly a woman after my own heart! Lovely to hear from you… yes, it’s such a pleasure doing these tasty frugal things isn’t it !!! I remember reading about the milk in first thing on your blog, without actually thinking I’d do it myself. I was engaging with it more as a philosophical idea. After reading today’s post, I might have to join in with this thing. I’m intrigued. Lovely post, by the way. Thank you, glad you enjoyed the post… love the thought of milk in first as a philosophic idea!I can see you converting all the tea drinkers at Ham House !!! I’ll certainly give it a good go! Valerie, I had similar musings when I recently watched a documentary on the migration of Monarch butterflies. It touched my heart to see one of the most fragile beings to migrate over such a long distance, bravely ignoring or dealing with uncountable dangers. They, like your birds, land on boats to rest and avoid drowning. But for every one butterfly you see resting on the sails of the boat, you know maybe a hundred or more aren’t that lucky. Best wishes to all those who cross seas and oceans. Best wishes to you to and thank you for the hilarious food for thought. Lovely to hear from you Paula… I must look for documentary… Nature is so brave and beautiful… I’ve just read Barbara Kingsolver’s Book ‘Flight Behaviour” which is also about monarch butterflies – it’s a heart-breaking and very moving book. Did your documentary discuss their loss of habitat in Mexico ? Glad you had a little giggle at the end… I thought we needed it !!! I hope you are able to see it on DVD or somehow. It discusses their loss of habitat and it makes you want to fly to Mexico and defend the trees they need. Thank you for the link Paula, … I’ll sit and break my heart !!!! I put out seed for the first time this year and no birds came. :( I think they are all enjoying life too much in your lovely garden paradise. How delightful to have so many birds, and such variety. I look forward to the return of the wax eyes each winter. Their voyages amaze me. They even settled as far as Vanuatu and Fiji and New Caledonia but have gone no further. I wonder why. Something to do with prevailing winds perhaps? ‘ a journey of a thousand leagues begins with the first step.’ is a wonderful final quote for your deeply thoughtful post. And, one first step is showing us the joys of quiet contemplation and, maybe, the second step is showing us the delights of frugality. what a lovely thoughtful comment… I so appreciate what you have to say. Ah, I will remain patient. And certainly there was a certain cat of mine skulking about. Glad you enjoyed it – thank you !! I could smell your garden and it wrapped around me this morning! Thank you for that. The picture simply made it all that much more clear, doubly thanks. The description of the birds was fascinating. Here in Texas, at least in my part, we don’t have a great number of really interesting or beautiful birds. I suspect it is the heat. Eight meals out of a chicken! I was feeling very proud to stretch it to three. 🙂 Your leg-recipe sounds delicious. Another of your creations that I must try! Sounds like you have hearty appetites to cater for !!! The chicken legs recipe is like most of my stuff, quick and easy !!! Wonderful piece. Couldn’t agree more! This is an extraordinary article Valerie. I actually say down with you while you shared about your coffee changes, I watched the birds that came by. I like so many are sickened by how we treat Earth. I am so small that I wonder when I recycle what good I do – but I continue. I also address other issues. It is all about the money. It sickens me. We share a love for some of the same philosophers. Yes, chicken can go a long way, the livers are my favorite! Hello LIz, thank you for your thoughtful comments.. I know how you feel about re-cycling and the small things we do… but in the end, I feel it matters for ourselves that we do what we know is right… and pray for another hundred monkeys!!! Yes, I love chicken livers too, but only organic !!! Hate to think what toxins must be in ordinary livers!!! Oh my, I love your garden! I am stuck in the desert and crave green and lushness. There is something special about this morning, knowing that these lovely little birds are across the world from me. It must be hard to get used to the aridity of desert landscapes…I have to admit that I always try to sink into a green oasis in my gardens…. I discovered by accident milk before adding my coffee a couple weeks ago..long morning thought I had already added coffee…you are right…a wonderful taste no bitterness…I drink tea that way since a dear English gentleman told me it was the proper way ! LOLs.. Your thoughts mirrored mine this past weekend. I felt time fleeting, moving in directions that were both frightening and exhilarating. We forget that we live on borrowed time, as do the many institutions that we have come to rely upon for security. Permanence can only be found in the moment, in what we chose to embrace. Your opening paragraphs clearly demonstrate this idea. May we remember to enjoy the moments given. And put milk in first. Love your parting shot – milk in first… I think there must be huge philosophic significance in that phrase if I put my mind to it… I think I can feel a weighty blog coming on discussing the psychology of pleasure as it pertains to the drinking of beverages and additives, and their order of precedence ! – how’s that? I love your garden/yard!!! I had to enlarge it so I could look and look and look. Just lovely. 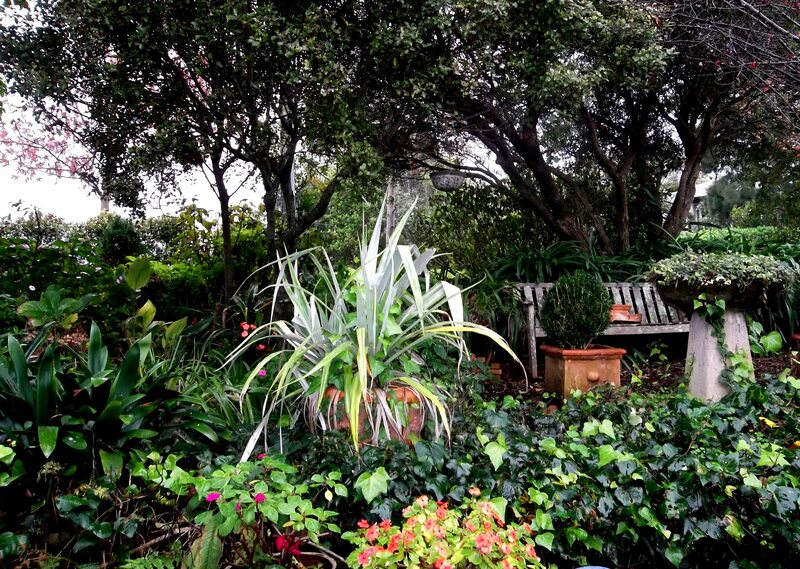 Your winter is our summer…I could never grow tropicals here. Just look at how lush they are in your fall…lovely. Just lovely. Even though we are farmers we try very hard to be good stewards of the land…There are those that think farmers are destroyers…we try not to be that kind of farmer. Dear Linda, thank you for your comments… I don’t know how to enlarge yet, but am hoping for another lesson from my darling grand-daughter! I don’t really go in for tropicals – in that picture just ivy and box, and clivea, and impatiens… can’t remember the name of the plant in the pot! But I can imagine that impatiens would wilt in your dry heat. I know you are both farmers who love your land and your animals and only do what is best for them – that’s why I love reading your lovely blog, like all your other devoted followers! Your words paint the loveliest pictures and are so wise and thoughtful. I need to join the Audobon Society over here so I know my birds better. Yours all sound beautiful. Maggie , how lovely to hear from you, and I appreciate it all the more knowing how busy you’ve been with the wedding and all the excitements. So glad you enjoyed the post. What a lovely idea to have an Audubon Society – we just have a prosaic Bird and Tree Society ! I have a book of Audubon’s paintings, and marvel at the wonderful varieties in America. Wonderful Valerie. Those little migratory birds remind me of the poor, so called ‘boat people’ who get such a hard time of it here in Australia when they land. 😦 Thanks for helping to raise our consciousness, and see the connection between us all. I know what you mean about the migrants…to tackle the horrendous journey and then receive the “welcome” that they do must break anyone’s spirit .. So good that you understand what I’m writing, thank you. I expect you’ve been celebrating Wesak ??? The photo is so verdant, and I had no idea that cyclamen were so scented either! and what inspiring words ” time to take that long stride of soul ” I’ll take those and use them. your praise for the garden gave me a great buzz from an expert like you. And thank you for your good wishes, so far, I’ve had lunch at a restaurant with my grand-daughter, inspected my neighbour’s two new saarin goat cubs/calves/ babies, and helped her get them into their new shelter in the rain. Tomorrow it’s five hours of Parsifal !!! Life is good !! !I hope your weekend is as satisfying… though I gather the weather is not too good…not allottment weather, then ! I should have said Saanen goats… I expect you know them from Switzerland??? Thank you Celi, and wow, what a surprise to see my view on your lovely blog… I thought there would be a long queue of glorious views in front of me ! And thank you so much for your generous words… I think due to you, I had a big spike of readers today !!! I do understand Celi… I feel the same about England, though I don’t want to live anywhere else but here. Pooh was not as stupid as he thought he was !!! I believe you should offer bird tours of you garden followed by a spot of tea or milk and coffee. I would be there. Included would be a special lecture/educational series on one of your lovely and profound topics. I do love your writings about your corner of the world. That sounds rather fun, a bloggers garden tour… I’m so glad you enjoy the blog… it sometimes feels rather self-indulgent !!! their great journey and noble hearts… what an eloquent way to describe. Thank you for the beautiful post, Valerie! Beautiful post, poetically written, I could smell and see your garden. Collective enlightenment, awakening, is what many of us are calling to the human family to do now. Its time. Yes, it is… and we can only start with ourselves and our blogs !!! !